Buoyancy is a force exerted by a liquid or gas that opposes an object's weight. Buoyancy can also be stated as the weight of displaced fluid. Pressure in a fluid increases with depth as a result of the weight of the overlying fluid (see hydrostatic pressure). Thus an object submerged in a fluid, experiences greater pressure at the bottom of the fluid than at the top. This difference in pressure results in a net force that tends to accelerate an object upwards. The magnitude of that force is proportional to the difference in the pressure between the top and the bottom of the column, and is also equivalent to the weight of the fluid that would otherwise occupy the column, i.e. the displaced fluid. It is for that reason that an object whose density is greater than that of the fluid that it is submerged in will sink. Archimedes' principle allows for the experimental determination of density by providing an easy and accurate method for determining the volume of an irregularly shaped object. See also: Mass, Volume Density..for interactive activities. Any object, wholly or partially immersed in a fluid, is buoyed up by a force equal to the weight of the fluid displaced by the object. with the clarifications that for a sunken object the volume of displaced fluid is the volume of the object, and for a floating object on a liquid, the weight of the displaced liquid is the weight of the object. Archimedes' principle indicates that the upward buoyant force that is exerted on a body immersed in a fluid, whether fully or partially submerged, is equal to the weight of the fluid that the body displaces. Notice that the acting forces increase with the depth of the fluid. The resultant of all forces upward is called buoyancy and is equal to the weight of the displaced fluid. Archimedes principle allows the buoyancy of an object partially or wholly immersed in a liquid to be calculated. The downward force on the object is simply its weight. The upward, or buoyant, force on the object is that stated by Archimedes' principle, above. Thus the net upward force on the object is the difference between the buoyant force and its weight. If this net force is positive, the object floats; if negative, the object sinks; and if zero, the object is neutrally buoyant - that is, it remains in place without either rising or sinking. In simple words Archimedes principle states that when a body is partially or completely immersed in a fluid, it experiences an apparent loss in weight which is equal to the weight of the fluid displaced by the immersed part of the body. Note: Archimedes' principle does not consider the surface tension (capillarity) acting on the body but this additional force modifies only the amount of fluid displaced, so the principle that Buoyancy = weight of displaced fluid remains valid. Consider a cube immersed in a fluid, with its sides parallel to the direction of gravity.. Only the forces on the top and bottom faces of the cube will contribute to buoyancy. The pressure difference between the bottom and the top face is directly proportional to the height (difference in depth). Multiplying the pressure difference by the area of a face gives the net force on the cube - the buoyancy, or the weight of the fluid displaced. When will an object float or balloon rise? A object will float in a fluid if the density of that object is less than the density of the fluid. Example: If you drop wood into water, buoyancy will keep it afloat. Wood is less dense than water. 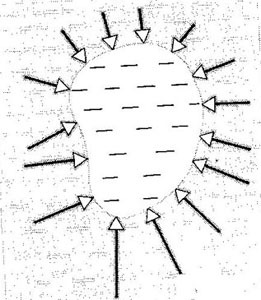 Hot air balloons rise into the air because the density of the air (warmer air) inside the balloon is less dense than the air outside the balloon (cooler air). The balloon and the basket displaces a fluid that is heavier than the balloon and the basket, so it has a buoyant force acting on the system. Balloons tend to fly better in the morning, when the surrounding air is cool. cube with sides of 3 cm (0.03 m). 2. Why do hot air balloons float? 3. What is the buoyant force acting on an aluminum cube that is completely submerged in water, and whose side is 2 m. The density of aluminum is 2.7 g/cm3. The density of water is 1000 Kg/m3, g is 9.8 m/sec2. 4. Why is it easier to lift a heavy rock that is submerged in the ocean than when the same rock is on the beach. 5. An iron anchor weighs 125 pounds in air and has a weight density of 480 lbs/ft3. If it is immersed in sea water that has a weight density of 64 lbs/ft3, how much force would be required to lift it while it is immersed?